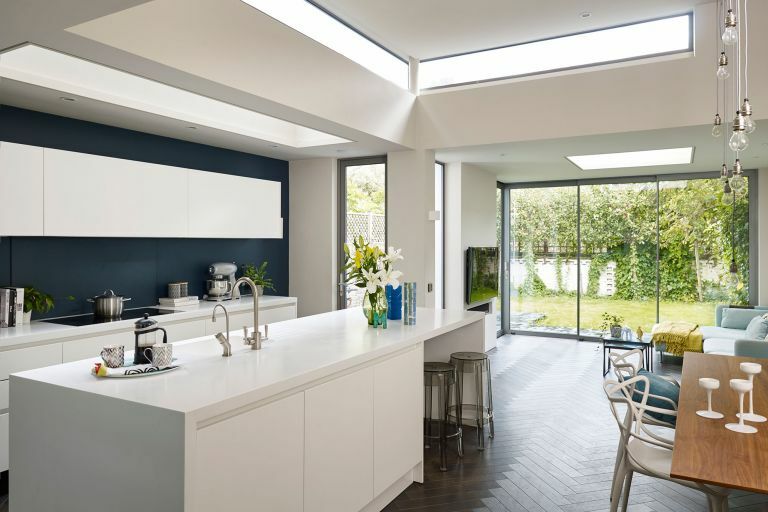 Observing the dos and don'ts of building an extension won't just save you a whole lot of hassle, time and effort, it can save you thousands of pounds, and make your home more valuable, too. So, whether you are planning a single storey extension, building a two-storey extension, considering a basement or garage conversion or designing a loft extension, use these dos and don't to get your extension right first time – all while saving as much money as possible. For more extension planning, design and costing advice, don't miss our ultimate guide to extending a house. Good design is about producing plans that clearly detail all the elements your builder will need to work to – right down to the depth of any steel poles that need to go in and the size of the window openings. The more that’s shown on the drawings, the less chance there is of things going off course. Want to work with an architect? Follow our guide to find out how to do it effectively. When main contractors quote for work, they are gathering lots of individual prices for the dozens of mini jobs that make up your project. The way to avoid costs changing wildly is to be very clear on specifications from the start (and, ideally, not to change your mind). Use our guide to find out how to compare quotes from tradespeople. So many different elements influence a builder’s price that it is impossible to predict what figure they’ll give you. Use our extension cost calculator to get a good estimate, or send your plans to a cost-estimating company such as Estimators Online, who – for a fee in the region of £100 – will give you a detailed breakdown of the costs associated with your project. It’s almost inevitable that you'll need a place to stow away the heavy materials associated with an extension. Where will they be stored? Are they secure? Will the storage stop you accessing your driveway? Thinking about this early on in the process can minimise stress later on. A good builder is more than just a skilled tradesperson. Look out for one who has a loyal team they can call on at a moment’s notice; one who provides a clear, agreed payment schedule; and, most of all, one with a positive, problem-solving attitude. Use our guide on finding a reliable builder to help source yours. One of the most stressful moments in any project is when the invoices arrive – particularly if they’re more costly than expected. The blame for this usually lies with you, for not being clear about what you want or changing your mind, and the tradesperson, for not communicating how costs were mounting up. The best way to avoid surprises is to all keep lines of communication open and be clear on variations to the original specification. Need to budget carefully? Find out how to cut the cost of your extension. Extension projects involve remedial work to the existing house – the extent of which is impossible to predict before the build starts and can incur unexpected costs. You might also decide to do further planned work at the same time to save on fixed costs for this at a later date. Getting planning consent (if you need it) isn’t the end of the story. You will also need to make sure you discharge any conditions they have made on the approval prior to starting on-site. These typically include providing details on landscaping schemes or external materials. Asking builders to forego their many years of experience to create something totally bespoke, or to use materials that are alien to them, is not the path to a smooth project. You are introducing unknowns into your scheme – which can result in unpredictable cost and scheduling outcomes. Go with what the builder knows – in most cases, they do know best. The building industry has its own unique ways of working, and some elements are not as customer-focused as you might be used to. Builders, particularly towards the end of a project, might go missing for the odd afternoon to meet potential new clients, or occasionally they might take a week’s holiday. It will all get done in the end. Find out how to project manage an extension or renovation to get it right. Almost any problem on-site during an extension project can be solved with money – and if you haven’t got it to hand, you can’t get anything done. Be honest with yourself about your finances and make sure you know where the money is coming from for each invoice. Increasing numbers of home extenders are buying their own materials – especially big ticket items like kitchens and windows. Make sure you order the materials early and get them delivered to the site in plenty of time. Work out the delivery deadlines with your builder – you don’t want to be the cause of costly delays. If you're taking responsibility for individual elements of the project, be clear with your builder where the boundaries lie. You might want to take on some of the final fittings, fit the flooring or do your own decorating, but it’s not always straightforward where one job starts and another ends. You might be fitting your own doors – but who will fit the door linings? If you’re doing the floor finishing, who is responsible for ensuring the floor is level? Extensions create a lot of rubble and waste. Make sure your builders are in a regular routine of rubble management and, if they’re not, do it yourself. It keeps dust down to a minimum and it saves a big job right at the end of the project. It will also ensure you can get ‘back to normal’ as quickly as possible once the job is over. To avoid getting dust in places where it's impossible to get it out, move all your furniture into storage during the project. If you can’t do that, then be strict about wrapping the furniture properly in dust sheets. Use dust barriers over doors (such as Dust Guard). Additionally, having a wet/dry vacuum around is a good idea if you don’t want to totally ruin your expensive Dyson. It goes without saying that having tools, heavy materials and lots of activity in your house is dangerous, particularly for young children. Keep your site tidy and ensure that tools get locked away every night by the tradespeople. Consider moving children away from the house during the most disruptive elements of the project. If you're flexible about when you can start your extension then ideally you should try to start in March or April, when there's little chance of the ground being too frozen to dig, or the air being too cold for brickwork. As the extension project begins to make the house feel more open to the elements, it’s much better to experience unplanned alfresco dining in summer than in winter. Not to mention, the lack of a heating system for a few weeks is more palatable in July than in January. Despite your best efforts, all sorts of things can go wrong with an extension project. The right renovations insurance will help to put your mind at ease. Notify your existing home insurance provider of your plans before you start and, if necessary, ensure you buy specialist extension insurance to cover the structural elements – in addition to unexpected mishaps such as materials going missing, or accidents happening to people on-site. How you approach the project mentally will have a massive impact on how it affects you. Despite all our best efforts, things do occasionally go wrong. Are you a problem-solver and constructive, or are you predicting failure before it’s happened? Do you go from serenity to full-blown stress in a few seconds, or are you able to shrug your shoulders and deal with difficulties in a positive way? Manage your expectations – this is going to be a tricky few months with a mixture of brilliant epiphanies and a fair share of alarms. If you can ride the project rollercoaster with a smile, it can make all the difference. The outcome, of course, will always be worth it in the end.